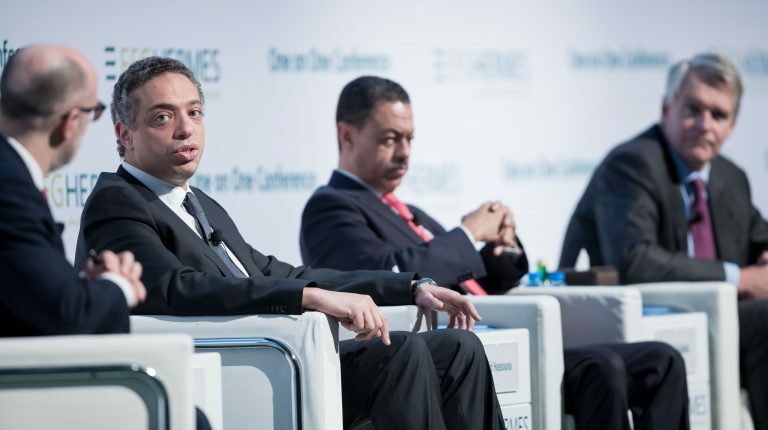 Walid Hassouna, CEO of EFG Finance Holding, said that microfinance has been growing in Egypt at a very high pace, with more than 100% annual growth rate because in the past 3-4 years, the banks have been challenged in reaching the unbanked. Hassouna explained that his company uses technology to reach clients and reduce the transaction costs. The company’s valU app, which allows customers to shop and pay in installments through the application, is an example of EFG’s interest in consumer finance. He added that they are the only company in the Middle East and North Africa (MENA) region that make a decision on credit in 2-5 minutes, through a fully automated process. Hassouna said that consumer finance is essential for maintaining the affordability of products in the country, across different segments including appliances, mobile phones, and furniture, and that his company is an engine of financial inclusion, as all their microfinance loans are reported to the national credit bureau. Consequently, there are people who have been clients for four or five years and are now taking EGP 100,000 loans from banks because EFG underwrote their businesses in the first place and brought them into the formal economy. Similarly, Khalid Elgibaly, MENA division president at Mastercard, said that financial inclusion is a fundamental engine of economic growth across the Middle East, North Africa, and other emerging economies. Explaining that Mastercard is looking at how they can best serve all their customers, including merchants, banks, non-bank financial institutions, and governments as the region moves toward a cashless future. “NBFIs drastically reduce underwriting times which expands access to financing and allowing smaller entities to build up their credit history eventually, allowing them to start taking larger loans for traditional banks,” Hassouna said. To do so, EFG Hermes has developed a programme to underwrite ride hailing drivers looking to finance a vehicle upgrade even when they don’t own the car. The programme look at over 25 data points from the drivers’ cash flow and income to how many hours they work, when they work, and their ratings from their customers. In a twelve-month pilot programme, 250 drivers were underwritten with a 0% default rate. Egyptian authorities have been planning to achieve financial inclusion and migrate towards a cashless society for years. To do so, Egypt has signed various deals with international credit card companies in order to increase online payments and reduce the need for cash transactions. Starting by government employees, almost all of them are now able to receive their salaries electronically. A step that will boost their ability to shop and pay bills online. Additionally, the country has switched all pensioners to electronic system. Going cashless would drive real growth, as cash comes at a high cost at 1-1.5% of GDP, Elgibaly said, adding that policymakers in Egypt know this. It’s why they established the National Payments Council headed by President Abdel Fattah Al-Sisi. “When it comes to accessibility, you need to think about the cost of delivery versus the benefit you get out at the end. Technology makes the cost feasible. Technology makes the whole population bankable,” he added. On the other hand, Dirk Brouwer, CEO of ASA International PLC, said that technology is critical, but despite that fact the technology may be used to disburse funds, and clients are still working daily with cash and repaying in cash. “It will be 10-15 years before our clients start trading in marketplaces using their mobile phones, but it will happen. 100% of our clients have a mobile phone, but only about 10% of them in some markets are smartphones,” he added. Brouwer explained that the biggest obstacle hindering a cashless payment system is access. Some large banks are slowly moving away from traditional services but, in general, most are still not successful at bringing banking to a large part of the population. NBFIs can help bridge this gap and quickly increase accessibility. Yet, it is critical that the regulators and central banks become involved, he added, citing Pakistan as an example of how regulators are keen to ensure that fintech works for low-income people, the largest segment of the population. “When you formalise a large chunk of the population you suddenly have large streams of income you can tax. This opens up a lot of possibilities as long as governments use this tax revenue effectively,” Brouwer concluded.